The used Hyundai Santa Fe is a mid-size crossover SUV that gives you the star treatment, combining car-like maneuverability with SUV-style utility. It's big on passenger and cargo space, offering three rows of seating and generous accommodations for your favorite people. This latest generation is especially good with tech features, providing all the best infotainment and smartphone integration options. Throughout its lifetime, the Santa Fe has set the bar for safety, making it a family-friendly option. On the road, the Santa Fe's car-based platform makes it easy to negotiate tight city grids. Its SUV-like power makes it a great candidate for adventurous rides and steep grades. When you're shopping for a used Hyundai Santa Fe, the third generation delivers an especially strong showing. It provides class-leading appeal, offering substantial power, comfort, and style. Now shoppers can choose between a seven-passenger, long-wheelbase version and a five-passenger model. No matter how big your family, the Santa Fe has you covered. The Santa Fe cabin out-classes competitors with it high-quality materials and plush, spacious seating. Convenience features, like the central touchscreen, make life easier. The larger model provides 80 cubic feet of maximum cargo space, making it easy to haul your thrift-store finds. If you're in the market for world-class safety, you'll love these used Santa Fe models. In government crash tests, they earned a perfect five-star rating for overall protection. The Insurance Institute for Highway Safety gave the Santa Fe its top score of "Good." Inside, the Blue Link telematics system treats you to problem-solving features, including emergency assistance and theft recovery. 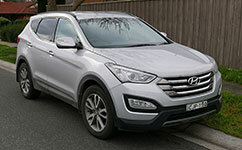 The third-generation used Hyundai Santa Fe combines SUV-like power with excellent fuel economy. In addition to saving plenty of money at the pump, you'll be able to tow up to 5,000 pounds. That makes the Santa Fe an excellent option for drivers with heavy toys, including boats and four-wheelers. 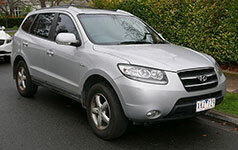 The second-generation Hyundai Santa Fe delivered high levels of comfort and support. Besides giving big families the space they needed to spread out, this crossover provided a stylish cabin and an excellent range of tech features. Bluetooth connectivity made it easy to connect your smartphone to the central system for music streaming and hands-free calls. Hyundai also stocked the second-generation Santa Fe with advanced safety features. The rearview camera, for example, helped drivers spot obstacles before they could become an issue. In 2012, Hyundai introduced a hill-decent brake control feature that steadied performance down steep grades. 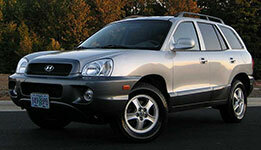 Even the very first Hyundai Santa Fe models were a cut above the competition. They offered both an affordable price tag and impressive warranty coverage, giving drivers the best of both worlds. Inside, the first-generation Santa Fe provided plenty of space for the entire family.